Remove 36 cards from the game. That's exactly half the deck! 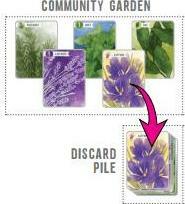 Place 1 card face up next to the Draw Pile to create a Discard pile. Place 2 cards face up from the Draw Pile to the Community Garden. Place 3 cards face up from the Draw Pile to the player's Private Garden. Place a Garden Divider between the Gardens. And lastly, put the Herb Biscuit in reach of the player. Changes for Step 2: Plant:. Place three cards in the Plant step , instead of two. One card is placed in the player's Private Garden. One card is placed in the Community Garden. One card is placed in the Discard pile. 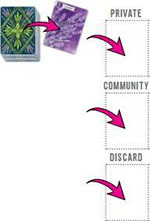 If at any time a fifth card is placed in the Community Garden, discard all cards in the Community Garden to the Discard pile. The player may pot on the first turn , unlike the multiplayer game. The Draw Pile is exhausted. The player may pot one last set of Herb Cards after the Draw Pile is exhausted if they have an empty pot. For an additional challenge, play again using the other 36 Herb Cards removed during Setup and add the scores together. Do you have two green thumbs? Can you score 114+ points ?